2013 has been a very busy year for me. I can't list down the things that I have done but there was hardly much free time to laze around. There seem to be many things that I wish to do yet not done [not because of procrastination] but really insufficient or not enough time to do it. Don't worry for me, there are no back logs that I can remember, as I always set my priorities right, hehehe! I don't think I owe anyone anything in 2013. BUT, I think there is only one thing that I must do in 2014, that is to try some of the many lovely recipes shared by all dear food bloggers. Those that I have bookmarked to try and yet to do. Some are as way back as 2011/2012. This is going to be one of my resolutions for 2014 - Must start to try them from now. So my dear friends, you may see a dish so similar to yours, that's if I did it right, hehehe! If I do try them and post the recipes after trying for record purposes but forgotten to link to the respective blogs, my sincere apologies. Hope you will give me a 'tinkle' if you do spot the errors and I'll update and link it up right away. I'm not young anymore and good memories do fail me at times. Anyway, I was happy all throughout 2013 and thought it was a good year for me with things running smoothly until Christmas Day. My family and relatives are healthy, safe and sound. But on the fateful early morning of Christmas Day, I lost my dear youngest brother in a road mishap. He left us so suddenly without uttering any words. Leaving his aged mother, siblings, his loving wife and two young daugthers. This really shattered my thoughts of a beautiful 2013 and a big blow to my family, relatives and even his friends. However, throughout the year, I have made many new friends through food blogging, outdoor social activities and recreational sports etc. I do appreciate all the valuable comments, feedbacks and advices which are very inspirational. Through food blogging, my friends, relatives and family especially my hubby and myself got to enjoy a wide range of yummy-licious home-cooked food in 2013. I think there were over 270 new recipes that I have tried throughout the year. To me, it's quite an accomplishment. With so much good food and bakes, I must say that none in the family has their waistlines expanding 'sideways'....Got what I mean. So it is still worth the effort to prepare home-cooked food. So much said, happy or sad, life has to go on. It's time to wish all readers/visitors of my blog and blogger friends a safe and good new year ahead for all. Most of all, please do enjoy visiting me here to keep me going"
P/S: To my dear readers and blogger friends, I will not be posting any recipe regularly as before as I'm not in the 'mood for food'. But I would love your visits to this blog even though the new postings aren't regular for the time being. Take care. Another roast chicken recipe with a fragrant marinade. Can be a yummy buffet party dish or a delicious chicken dish with rice for dinner. Again, no oil needed or frying to do. Only marinating and roasting them in the oven before dinner. Looks like I'm into roasting meats these days with hike in electricity. Should have done this kinda of dish more often before January 2014, hehehe! Original recipe is from The Waitakere Redneck's Kitchen. Taste - aromatic chicken with garlic and peanut butter. The Hoisin sauce [sweet, sourish sauce] added more flavour to the chicken. Overall, these are tasty and yummy roast drumsticks most people would like to indugle. Mix marinade well. Rub some under the skin and all over the skin of the drumsticks. Marinate for at least 3 hours or overnight in the fridge. Preheat oven at 220 degrees C. Place drumsticks on baking rack above a baking tray. Roast chicken for 20 minutes. Then turn over to roast the other side for another 15-20 minutes. Turn to grill function and grill for the last 5-10 minutes if you prefer the skin a little charred or until chicken is cooked. Christmas Day will never be the same to me cos' it is the day I lost my youngest brother suddenly in a road mishap. It is a day that will no longer be joyous to our family. 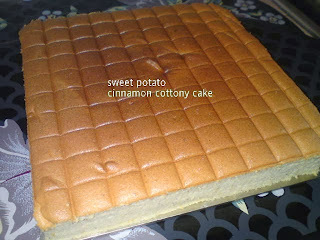 I have baked the Purple Sweet Potato flavour cottony cake sometime ago [recipe here]. This time, I used orange sweet potato and added cinnamon powder. 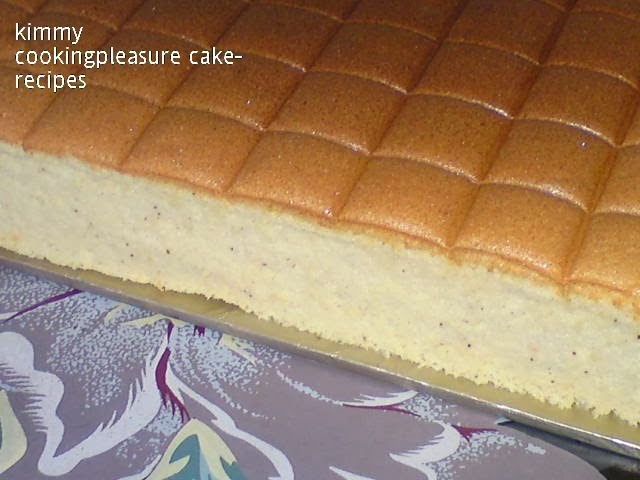 Cake turns out well with no cracks cos' I had used a bigger pan [9 inch] instead of 8 inch pan. This has resulted in a lower cake compared to the earlier one where I used an 8 inch pan. Anyway, the texture is the same - soft, spongy and moist with a tinge of cinnamon. Line base of a 9" square tin with grease proof paper. Whisk egg yolks and 1 whole egg with mashed potatoes, flour, milk and corn oil. 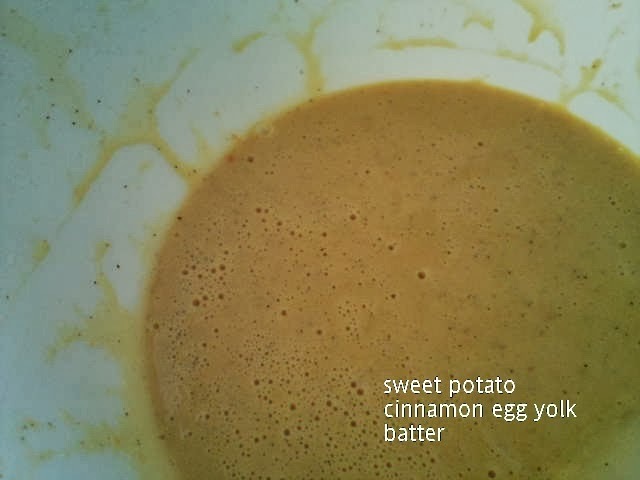 Whisk until well combined and batter is smooth. Set aside. Pour the batter into prepared cake tin. Tap baking tray on work surface a few times to release trapped air bubbles before baking. Place it over the baking rack to steam bake cake in a preheated oven at 170 degrees C for 45 minutes [by then the water bath would have dried up]. 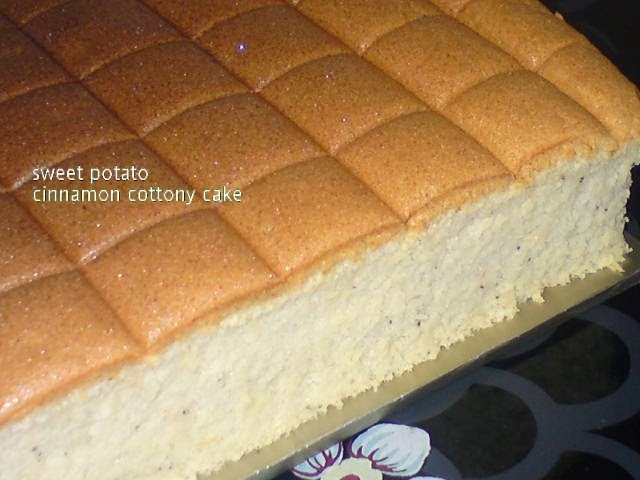 Remove cake and invert it to cool for about 5 minutes. Turn over and run a thin spatula along the edges to dislodge the cake. Invert again to remove baking tin and the paper linings immediately and leave cake to cool on a wire rack [base facing upwards]. 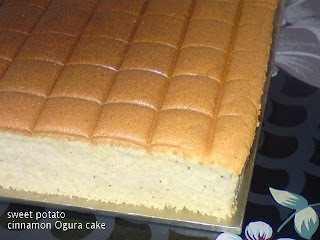 The cake may shrink a little when cooled because of less flour used [low gluten cake]. Turn the cake over when completely cooled. Refrigerate before slicing if preferred or sliced to serve immediately. Cakes keep well in the fridge in airtight container. A roast chicken recipe with simple ingredients. Pairs well with onions and salad or just another yummy delicious chicken dish with rice for dinner. No oil needed or frying to do. Only marinating and roasting them in the oven before dinner. Original recipe is from The Waitakere Redneck's Kitchen , which is for 1 whole chicken but I used only 3 chicken thighs as I'm serving it just as a dish to go with rice for dinner. Taste - aromatic from the spices/herbs and slightly sweet sourish taste from the plum sauce. I added some salt and pepper for taste. Heat saucepan on medium heat. Add in sugar to dissolve but not caramelised. Add herbs, on low heat add water and plum sauce. Boil gently for a few minutes. Pour sauce over chicken and marinade for at least 4 hours or overnight in the fridge. Preheat oven at 220 degrees C and roast chicken for 20 minutes [skin side down]. Then turn over to roast the skin side for another 15-20 minutes, brush some extra plum sauce over the skin and sprinkle sesame seeds [turn to grill function for the last 5-10 minutes if you prefer the skin a little charred]. Cool and cut chicken or serve as a whole piece immediately. Note: If using whole chicken, just increase the marinade and roast chicken at 170 degrees C for 1 hour or until cooked. Left over marinade can be boiled, freezed and reused for next plum sauce chicken preparation. Kuih Ee [湯圓] - 2013 [for 冬至 Dongzhi Festival], a busy day apart from making the glutinous rice balls in ginger sugar syrup soup, I also have to prepare a variety of dishes and other foods for ancestral worship at my MIL house. Luckily, it falls on a Sunday and I have a Saturday to make the preparations. I won't be posting the recipe for the Kuih Ee [for the recipe, please look up my earlier posts on Kuih Ee] but only some photos of it. 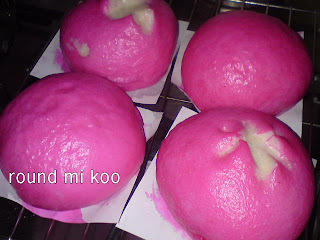 This year I was lucky, my neighbour gave me some natural colourings for my kuih ee. I made 5 colours [white, red, yellow, green and blue] for this year's rice balls [tang yuan]. The green is from pandan paste, yellow is from pumpkin and blue is from the blue flower [bunga telang]. I used Bentong ginger for the sugar syrup. The end product - yummylicious tang yuan [湯圓] [kuih ee]. For ancestral worship, I had a long list of items to prepare [some are specified by my MIL, while some I can try out with different tastes]. My mother in-law's list of must have. - a curry dish [I cooked the Fish Sauce Curry Chicken, recipe from Yum Yum magazine] - recipe posting soon. 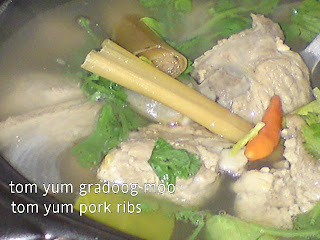 - a soup dish [I cooked the Tom Yum Pig Trotter Soup, similar to my Tom Yam Gradoog Moo]. I replaced the pork ribs with pig trotters because I was told that pork ribs cannot be used for ancestral praying [I don't know why - anyone knows the reason?]. Too busy, didn't have time to take photos of the soup with pig trotters. 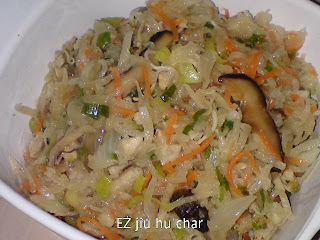 - a noodle dish [I cooked the Hokkien Fried Yellow Noodles - non-vegetarian] [picture shows the vegetarian version]. - Rice and wine etc..
Of course, as a Taoist's family, burning of josspapers and paper money for our fore-fathers/ancestors is a must have too. After prayers usually by 12 noon, it is time for the family members to feast on the food prepared, hehehe!. Most times, I'm too tired to enjoy the food after an early start to prepare these things....and later the clearing and cleaning up to do. This is how I spent Solstice Day year in and year out since I got married....hehehe!